A review requested by Arlo Banta, with thanks for contributing to the Second Quinquennial Antagony & Ecstasy ACS Fundraiser. If you are like me at all, the notion of Cartoon Network making its first-ever miniseries probably budged you not at all, and knowing that this miniseries was greeted with almost exclusively enthusiastic reviews only made it worse. For critics and audiences have something they look for out of Cartoon Network stuff, and they find it, God bless 'em - but it is not and has really never been what I look for. So if you are like me, you sat out Over the Garden Wall during its premiere week in November, 2014, and that was a tremendous mistake. It's not perfect, mostly because it's still buried in the Cartoon Network house style - series creator Patrick McHale, and a great deal of the writing and design staff, logged plenty of hours with Adventure Time - which I can't help but feel isn't the perfect fit for what's going on here. But for an imperfect thing, it's extraordinarily special, and goes straight onto the pile of things I'm angry weren't around yet when I was a child, because it must be truly wonderful to be able to encounter this from that perspective, rather than trying to fake one's way into it. The story is broken into ten episodes of eleven minutes each, bound in pairs for the purposes of television scheduling. And it is certainly episodic, far more than it seems explicitly serial. Almost half of the episodes could be dropped entirely without leaving any meaningful gaps in the story; yet it's also impossible to think of it working as well without all of them in place (and, for that matter, impossible to think of this as really just a 110-minute story divided into chunks; it takes great care to use the episode breaks as a way to let the viewer recalibrate and push the narrative ahead so that it's always perpetually starting in medias res). What those seemingly random misadventures in the middle actual do is to give the whole story the feeling of Pilgrim's Progress, in which each disconnected episode serves to change the characters in small but cumulative ways that leave them able to leave the story very differently than they began it. And the series knows this, explicitly dropping the word "pilgrim" at one point. It also draws from The Divine Comedy, giving its pilgrims a guide named Beatrice, because once you've started in with the classical religious literature references in your TV kids' cartoon, you might as well just keep doubling down on it. The pilgrims are Wirt (Elijah Wood) and Gregory (Collin Dean), half-brothers who find themselves, at the start of the first episode "The Old Grist Mill", confused as to where they are, how they got there, and how to get home. Teenage Wirt does, at least. Little Gregory is living in a sort of constant present tense, totally unconcerned with anything in the dark woods or with his brother's nervousness, and mostly interested in giving a name to the frog he's carrying around. Also, Wirt is dressed like a garden gnome and Gregory has a teapot on his head, facts which seem to bother none of the equally inexplicable characters they meet during their journey. The first of these, and the ones who come back the most, are a talking bluebird, the aforementioned Beatrice (Melanie Lynskey), so there's some Der Ring des Nibelungen in there on top of the rest of it, and an old woodsman (Christopher Lloyd), who skulks around in the most menacing sort of way and acts exactly the way you'd expect someone to right before he buries an axe in your head, and yet her turns out to be almost unfailingly helpful, pointing out that the boys need to be constantly aware of the Beast that haunts those woods. The show ultimately reveals its backstory, near the end, and it's perfectly timed; by that point, we've gotten used to the steady rhythm of the show (each episode follows the structure of "Wirt and Gregory find themselves in some new mad place, and by their actions better the lives of the inhabitants, without advancing their trip home by a noticeable amount"), and have seen enough of the changes in the boys that being sent back to square one with both of them is a bit of a shock, and it helps to clarify the show's overarching themes. Which I'd be reluctant to discuss too much for fear of spoiling things - though as befits something targeting children, it's really not hard for a particularly genre-savvy adult to guess the basic shape of the show fairly early on. Let's just say that neither the Pilgrim's Progress nor Divine Comedy references are at all incidental, and the show's overall message is a surprisingly moralistic one: in order to move towards the goal, one must make a reckoning of the kind of person that one has been, and take steps to be better. For as surprisingly sophisticated as the series is - it trusts its audience to be willing to think hard about life and themselves more than any other piece of American children's entertainment from the 21st Century that I can immediately call to mind - it has enough immediate pleasures that it's already proven to be singularly engaging and compelling long before the thematic shape starts to become clear. There's mood and atmosphere to spare here: it is set in timeless autumn, and everything about the color palette, lighting, and even the stories emphasises this. The second episode, "Hard Times at the Huskin' Bee", is an especially beautiful evocation of a harvest festival atmosphere, and like most of the other episodes, it has the shape of a ghost story to be shared over a campfire as the air grows cold. The seventh episode, "The Ringing of the Bell", includes an image that even managed to freak me out, wizened old horror buff that I am, not least because of the slow, inexorable way it builds to its big scare, and then suddenly ramps forward at the last second to hit harder when it arrives. But then, the whole show exists in a discordant world of fable and horror, taking things that are normal and common and warping them through the medium of animation and the writers' offbeat comic sensibilities (it's also one of the best blends of comedy and horror I've seen in a long while, allowing that the kiddie-postmodern Cartoon Network sense of humor is not really the same as my own) to make them strange and oddly threatening even at their kindest. Like the never-homicidal but always terrifying woodsman, or the sweet Beatrice, brilliantly voiced by a best-in-show Lynskey as sunshine and optimism, even when she makes it clear that she honestly kind of hates both of the boys. It's an ethereal show, that's what it is, one that feels like bedtime stories and weird dreams made up of snatches of urban legends. Further pulling it out of time, the whole series is driven extensively by music: both flat-out musical numbers, but more often its deeply insinuating and atmospheric score, composed by a group called the Blasting Company. It's a mixture of folk music, pre-WWII pop, and a kind of Victorian-feeling dance music; a polyglot that at any rate feels like it could have been assembled, in exactly its present form, at any point from the 1930s onwards. It adds immeasurably to the sense of timelessness and placelessness of the show - it might, indeed, be the case that the music is the most important single element of the series, more than the backgrounds and color and their peerless evocation of autumn, more than the colorful voice acting, more than the light but never unserious dialogue. It's remarkable to listen to, elegiac and romantic and funny all at the same time. 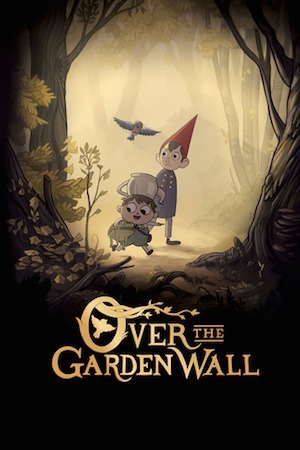 And I have put off talking about the animation, because I loved Over the Garden Wall, but I loved that the least. It's certainly an intentional show, in terms of its design: there's a pronounced affection for the Fleischer cartoons of the '30s, which I'd ordinarily love, and in the one big '30s showcase sequence, a dream that occurs in the eighth episode, it works perfectly. But the broad, round cartooning seems a little too, I don't quite know, too frivolous? It resembles Adventure Time by feeling somewhat like the sketches an especially talented grade school student might make, given life, and that's an admirable aesthetic mindset in many of their projects. But given how much of Over the Garden Wall is cemented in folk art, having the big eyes and internet-comic goofiness of the characters strikes me as a little off. It's surely the case that the non-human characters, and the most overtly grotesque and otherworldly of the humans, look more appropriate than the leads, or the "normal" people they stumble across through their adventures. Gregory, in particular, looks too much like a doodle; I won't deny that it takes skill to animate someone like that and give him a real, obvious personality, but I simply don't like looking at him. It is, of course, a taste issue. But we all have our own tastes, and no matter how much is going right with a thing, that's an insurmountable obstacle. 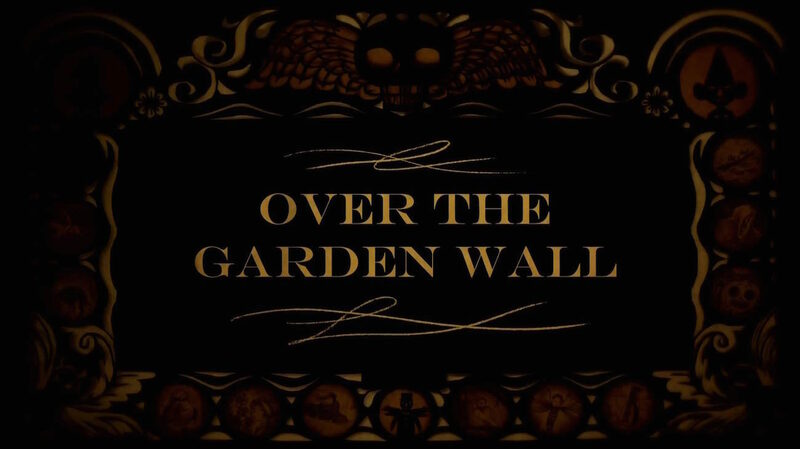 Still, everything else goes right with Over the Garden Wall, so I don't want to harp on it. The world and the stories told in are so compelling that the rather generic protagonists are only a little liability; and I am powerless to resist anything that does such a great job of communicating the damp cool and colorful weariness of autumn through purely visual means. This is one of the most entrancing works of animation I've seen in a long time, even if the animation is, itself, nothing terribly special, and if nothing else, it's already permanently secured itself a spot in my annual Halloween week viewing schedule.